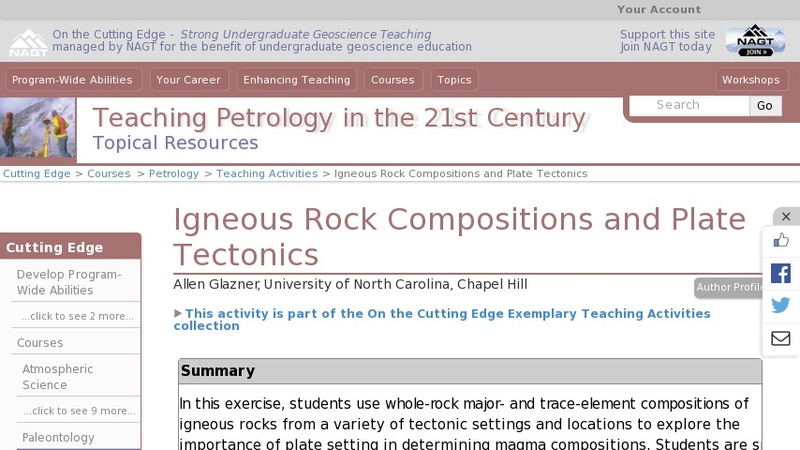 In this exercise, students are split into groups to gather whole-rock geochemical data (major-, trace-, and rare-earth elements) from the GEOROC database for igneous rocks sampled from four different plate tectonic settings: mid-ocean ridges, subduction zones, oceanic islands, and oceanic plateaus. Each group is assigned a different plate tectonic setting and collects three datasets from different locations for their tectonic setting. Geochemical data is graphed as major-element variation and REE diagrams to quantify igneous diversity both within the same tectonic setting and between different tectonic settings. The main goal of this exercise is to demonstrate that igneous rock compositions are a strong function of plate tectonic setting.